We are a registered charity and all donations are tax deductable. Click the Donate button below, enter your donation and which area you would like it to go to. No Events at this stage. Like to receive the latest news on what is happening at BTC? Subscribe and we'll keep you updated. 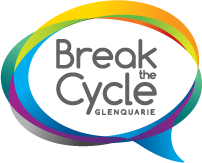 Sitemap | Copyright ©2019 Break the Cycle Glenquarie Inc. All Rights Reserved.